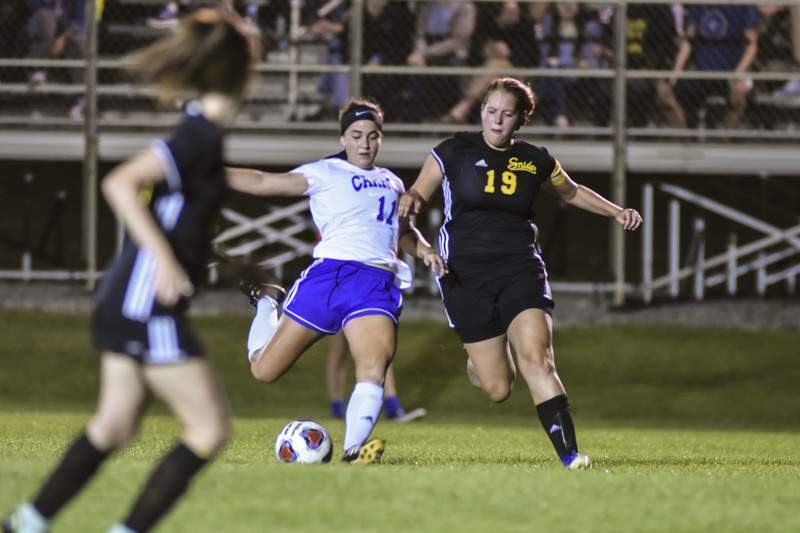 Mike Moore | The Journal Gazette Carroll's Eva Toscos kicking the ball against Snider defender Haley Lydia Haydock at Carroll High School Thursday. Mike Moore | The Journal Gazette Snider's Nyasia Hardy blocking a kick from Carroll's Mia Bodenstein at Carroll High School Thursday. Mike Moore | The Journal Gazette Carroll's Calista Geiger driving the ball against Snider defender August Montgomery at Carroll High School Thursday. When you’re the four-time defending champs, you’re going to get everyone’s best effort. 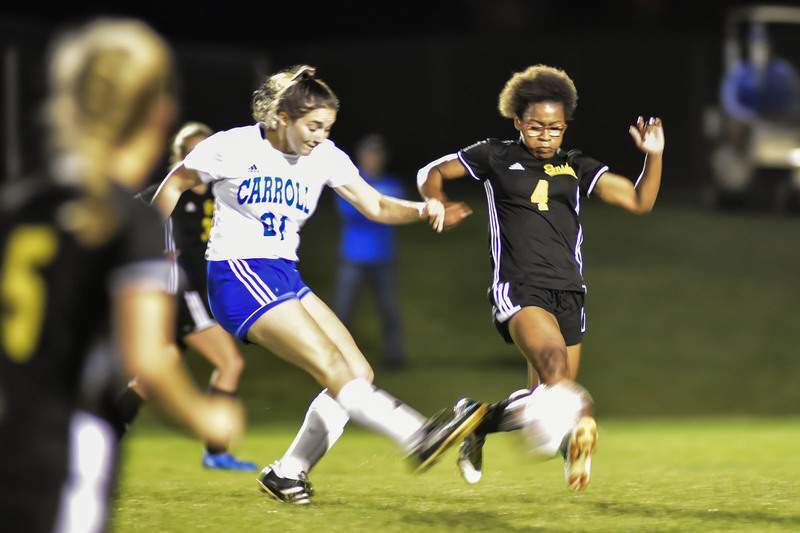 Such as it was for Carroll Thursday night, which fought off some tenuous early moments before pulling away from Snider 5-0 to advance to a Class 3A sectional championship Saturday. Snider looked to surprise with an early goal. A shot from near midfield was misplayed in goal by Carroll goalkeeper Kaitlyn Sagan, sailing over her head and bouncing off the crossbar. A couple inches lower, and the ball finds the net, which would have changed the game’s complexion. Instead, it served as a wake-up call, as Calista Geiger, Aubrey Vince and Mia Bodenstein each scored first-half goals to help the Chargers (14-4-1) win their seventh straight game. 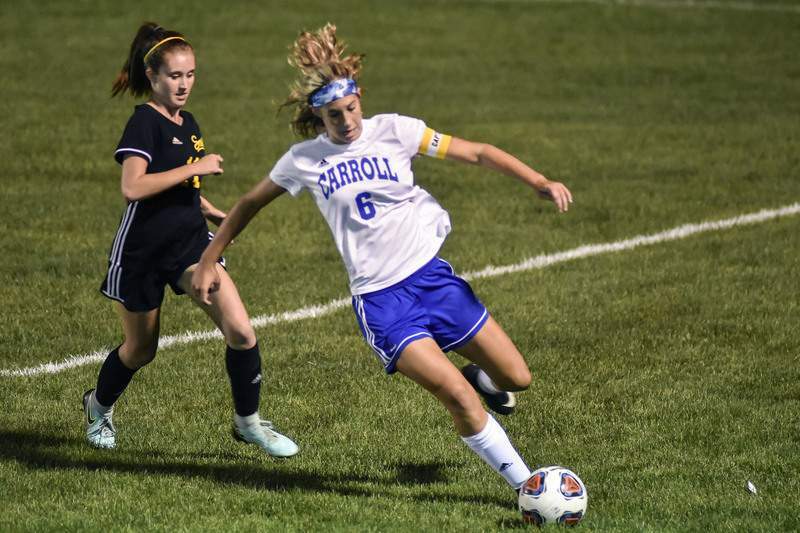 While Eva Toscos, Carroll’s co-leading scorer entering Thursday’s contest, found herself secluded from the scoresheet at halftime, she did pick up an assist on Geiger’s second goal. Toscos’ shot from the keeper’s left caromed off the crossbar, and Geiger headed home the rebound to put the hosts up 4-0. Toscos wouldn’t be shut out, however, corralling a loose ball out of a scramble inside the game’s final minute. Geiger stressed the importance of that goal, Toscos’ 11th on the season. Thursday’s final score looked nearly identical to the regular-season matchup, a 6-0 Carroll victory on Aug. 29. Snider coach Gabrielle Shipman said the two games didn’t play out in similar fashion. Smith said he expects more of the same from East Noble in Saturday’s championship match.